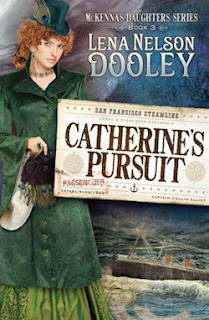 Today, CFBA introduces Catherine's Pursuit by Lena Nelson Dooley. When Angus McKenna was forced to give two of his daughters to families in the wagon train, he promised he'd never try to contact them. Catherine made no such pledge. But when she sets out to find her sisters, she doesn't go alone. Angus sends Collin with her. Will they discover the two women---and love? Catherine's Pursuit wraps up the story of the McKenna triplets. Without her father's knowledge or permission, Catherine sets out to find her sisters. When Angus discovers she is missing, he sends his young employee after her. Just the thought of trying to find someone in those days (today, the internet and TV has made it almost impossible NOT to be found!) makes for a fascinating story. Of course, the ease with which the triplets found each other may have been a bit unrealistic, but being triplets helped that idea along (easily recognizable as someone else). I liked that Lena dealt with fear and rejection in this story. Collin has to face his almost debilitating fear of captaining a ship again, and the girls must come to terms with their father's rejection. If you've already read Maggie and Mary's stories, you'll want to pick up book 3 and finish the triplet's journey! Thank you to Lena and Realms through CFBA for sending me a copy to read and review!